Tritons now ranked No. 14 in Division II, highest ever in school history. The UCSD men’s basketball team’s stellar play continued without any issues last week, following their upset of the previously undefeated Cal Poly Pomona and crushing San Francisco State and Cal State Los Angeles. The No. 14 Tritons are now 12–2 overall and 7–1 in California Collegiate Athletic Association play heading into the last two games of their four-game road trip. To say the Tritons did well against the San Francisco State Gators on Thursday night would be an understatement. From the start of the game, the Tritons absolutely dominated the Gators, scoring at will against a Gator defense that couldn’t stop a bloody nose. By the end of the half, the Tritons already held a 15–point lead over the Gators, leading by as many as 21 points earlier in the game and never trailing. Credit is due to the spectacular Triton offense, as they shot a stellar 54.5 percent from the three-point stripe and 55 percent overall in the first half. Junior guard Aleks Lipovic lead the first-half charge with two three-pointers and nine points total. On the flip side, the Gators couldn’t get anything going on offense, only hitting 25 percent of their first-half shots and shooting an abysmal 18.2 percent from the three-point line, clearly stymied by the tough Triton defense. The Tritons’ success did not change in the slightest during the second half. 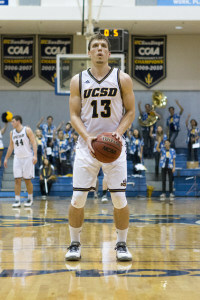 While the Tritons allowed the Gators to climb within 12 points, UCSD continued to blow the Gators out of the water, eventually winning by 73–48 at the end of the night. Leading all scorers with 16 points was Lipovic, also contributing four rebounds. Junior guard Adam Klie continued his impressive play with a line of 12 points, five assists and five rebounds, while sophomore guard Grant Jackson also played well, scoring 10 points and grabbing five rebounds. The UCSD men’s basketball improved to 11–2 overall and 6–1 in conference play, while SF State fell to 7–5 overall and 1–5 in conference play. While Saturday night’s final score would indicate the Tritons had an easy time at Cal State LA, the first half of the Tritons’ road game against the Golden Eagles was a close affair. With six lead changes and two tie scores, the Golden Eagles challenged the Tritons far more than the Gators had a few nights before. But that wouldn’t last long, as the Tritons found their groove by the end of the half, where a three-pointer by senior forward Drew Dyer put the Tritons up seven. And after that, the Tritons never looked back, dominating the Golden Eagles effortlessly. 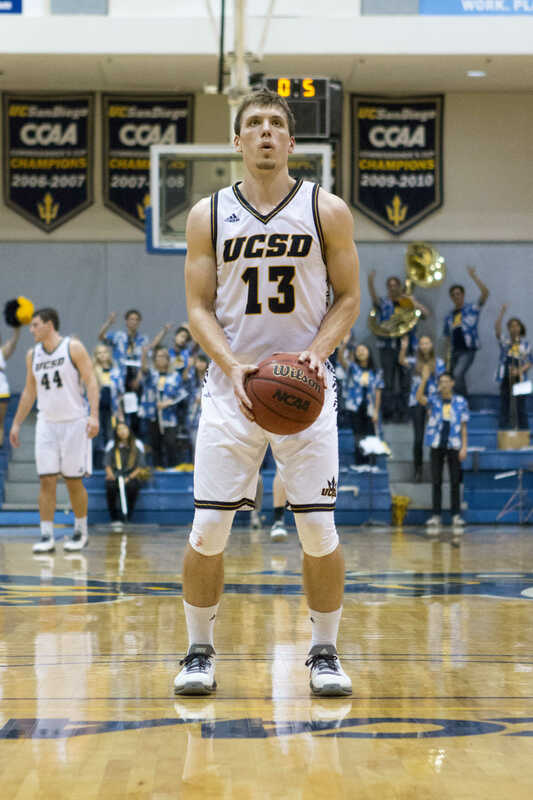 “We are excited to grind out a road win tonight,” Olen told the UCSD Athletics Department. Dyer was hot out of the gate, hitting his first five out of six shots and scoring 14 points in the first half. Klie contributed 10 more points off of similarly efficient shooting, hitting five out of seven shots. While the Tritons weren’t shooting as well as they had in the first half, their 44-percent shooting percentage was enough as they were able to hold the Golden Eagles to 33.3 percent, increasing their lead to 14 by the end of the game, winning 78–64. Dyer finished with a team-high 20 points and eight rebounds with Klie close behind with 19 points, five rebounds and four assists. Freshman center Chris Hansen shot an efficient 7–9 on the way to scoring 16 points, while Lipovic brought in another 10 points, even when his three-point shot wasn’t falling. The team shot 50.9 percent overall, marking it their tenth game shooting over 50 percent. The Tritons handed the Golden Eagles their 12th loss of the season, making them fall to 2–12 and 1–6 in conference play. The Tritons will continue their road trip when they head to Cal State East Bay on Jan. 15.